"Soft, Easy T-Handle Grip & Sturdy Rubber Base"
• Height adjustable from 33 to 37 inches; weight capacity: 250 lbs. Perfect for men and women, this unisex blind folding cane from Harvy canes features an ergonomic contoured soft rubber T-handle that gives you a nice, comfortable grip that is very easy on the hands. This 4-section lightweight aluminum folding cane for the blind and visually impaired is height adjustable from 33 to 37 inches in 1-inch increments, and the sturdy rubber base tip supports up to 250 lbs. The four folding sections snap out automatically for easy use, and the top 3 sections are wrapped with silver reflective tape while the bottom section is wrapped in red reflective tape (6 inches). When not in use, this cane folds to 15.5 inches for easy, convenient storage. 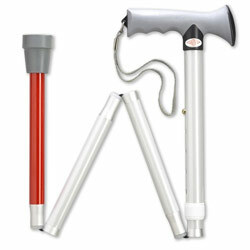 Note: The Unisex Adjustable Height Aluminum Folding Cane weighs 12.3 ounces and contains natural rubber latex.